Elementary, one of our favorite detective drama/comedies returns to CBS tonight with an all new Thursday November 26, season 4 episode 4 called, “All My Exes Live in Essex,” and we have your weekly recap below. On tonight’s episode, when Holmes (Jonny Lee Miller) and Watson (Lucy Liu) investigate the murder of a fertility lab technician, they discover the woman had a secret personal life that leads them to multiple suspects. On the last episode, Sherlock offered to help his father resolve a work issue in exchange for his prompt departure from New York City. Meanwhile, Holmes and Watson investigated the murders of two men who looked alike. The probe lead them into the world of facial recognition technology. Did you watch the last episode? If you missed the episode we have a full and detailed recap right here for you. Are you looking forward to the season 4 episode 4 tonight? Be sure to come back here later tonight at 10 PM EST for our awesome recap of this episode. In the meantime, hit up the comments below and let us know how excited you are for season 4. 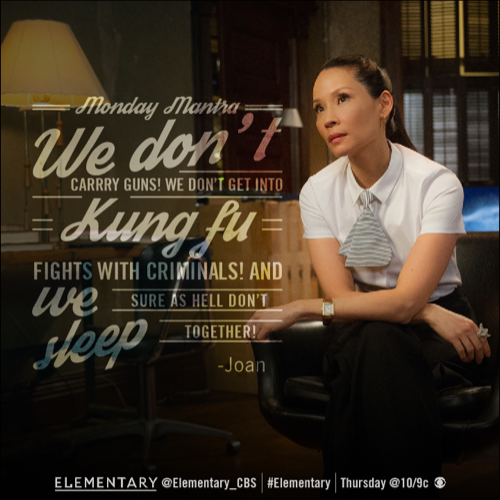 #Elementary begins with Watson trying to get herself out of handcuffs behind her back. So is Sherlock. She asks what if they really are unpickable like they claimed? He calls it a marketing ploy and says they are simulating field conditions. She almost had it. Her cell rings and he’s annoyed at the ring tone but he hasn’t cracked her passcode to change it. He’s out of the cuffs then she is a moment later. Watson’s old hospital is calling them about Abby, a lab tech, who is married to a doctor and has gone missing. Watson asks if Abby could have left without telling anyone but her former boss Tamara says Abby has a kid and it would be out of character. She asks if they can help. Sherlock and Watson go to Abby’s lab to look around. They check out her workstation. Abby is a fertility specialist. Sherlock says the rise in the age of women giving birth has led to an increased need for fertility specialists. Watson says Abby could have slipped out since surveillance there is not complete. Watson gets a text from Emily who wants to talk urgently. Sherlock asks if her whole social network is in crisis. Sherlock notes that Abby’s workstation and only hers has been thoroughly cleaned. Sherlock looks under a counter and talks about gurneys – Watson says gurneys aren’t used in this wing and he says a gurney was used there. They follow the tracks to a rarely used area where a gurney rests. Watson says it’s a prep lab for medical specimens where body parts are chilled for research. Sherlock says Abby is dead and shows a chip in her tooth. There is a research skeleton there. Looks like it’s Abby. They take the skeleton to the medical examiner’s office. Marcus says they confirmed by her dental records that it’s her. Marcus wonders why leave the skeleton and Sherlock says the killer wanted it in a lab somewhere. Marcus says the killer took her apart. Sherlock says this would have taken expertise to do, especially so fast. Sherlock says there are any number of suspects that could have done this. Sherlock says the hyoid bone is missing and so he thinks she was choked to death and the killer may have taken it to cover up cause of death. Sherlock says she must have known her killer since her workstation faced the door and she would have seen him coming. Watson goes to meet Emily. She tells Watson that a detective came to her house this morning and she let her in but then she was asking all about Joan. Emily hands over the card – the name is Gina Cortes and she’s from Coney Island. Emily says she was asking personal stuff like how often they see each other and if Joan would break the law. Emily says Gina told her she couldn’t explain why she was asking questions. Emily asks if she’s in trouble and Watson says there must have been a misunderstanding and says she’ll look into it. Nate, the husband, is in interrogation with Sherlock and Marcus. He says he’s been with Abby five years and have been married for three. Sherlock asks if he’s a rock climber and he says Abby got him into it. Marcus says he’s a likely suspect and Nate says he didn’t kill her. He says the night that Abby disappeared, he was doing the books with the clinic manager. Marcus asks why he didn’t report her missing. He says his wife works long hours and told the nanny she would be late. He says he came home tired and went to bed. Sherlock asks if their marriage is happy and Nate says they were in love but she had stage four pancreatic cancer. He says she didn’t want anyone to know and says she only had a year or so to live. He says he wouldn’t have killed her because the cancer was doing it anyway. Watson comes home to loud music playing. She goes upstairs and finds him watching security cameras. He says he’s playing music to annoy her. He says he also like the song about the mystery of who let the dogs out. He says Abby went to the cafeteria then nothing. He’s looking at older video looking for unpleasant interactions. He shows Watson a clip of her flirting with a man – Dr Branford Fisher. Sherlock says they have no professional reason to interact and only talked in out of the way area and then he shows one of them slipping into a patient room. He says Dr Fisher called in sick the day she was reported missing and his address in the records is a PO box. He asks about Emily and she tells him about the nosy cop. Watson says two other of her friends called her today to tell her the same thing – they asked what kind of person she is and would she ever break the law. Sherlock asks if she’s burgled anything in Coney Island. Sherlock says they need to talk to her. He says they can’t have rumors like this when they just got their cop helping jobs back. Nate Campbell calls and says he knows where Branford is and asks Sherlock and Watson to come without the cops. They do but tell the cops where they’re going. Dr Fisher is there at the house and says it’s complicated. Nate says Brandon would not have hurt her. Sherlock notes some personal items and says they’re both married to Abby. Sherlock calls it a thruple. Nate says neither of them killed their wife. Nate says they had to keep their relationship secret because of their careers and to protect their daughter. Fisher says he was in Boston visiting his dad who was sick. Watson asks how this arrangement came about. Nate says he and Branford were a couple then they met Abby. He says Abby had been in another group relationship prior to theirs. Nate says in her last group marriage there was a dispute with one of her fellow wives and says there were six in the last marriage. They pull files on the last group thing – the others live in Essex, all still together. Gregson says he couldn’t even make it work with one wife. Sherlock says many marriage experiments have worked out well. Marcus says they brought in the spouses. One wife says she loved her. One husband won’t talk. Another says she was great. One wife says she was stubborn and another complains she should be at a soccer game. One guy says Abby made good money and wanted to keep her money separate. They tell the cops that Abby was pressured by Denise to use an inheritance to help buy a house. They hear about bitter arguments plus Abby was younger than Denise and got more sexual attention. Another wife says Abby left after Denise shoved her. Abby wanted her down payment back. Denise is there and she threatens the NYPD if they call her any embarrassment. She’s a lawyer. Sherlock says her expertise is contract law not litigation. Marcus says unless she wants her private life in the press, she needs to cooperate. Gregson asks about the $100k down payment. Denise says Abby didn’t need the money. Denise says she and Abby had lunch a few weeks ago. She says they buried the hatchet after Abby told her about the cancer diagnosis. Denise says Abby signed over her share of the house and says she loved Abby once. Sherlock asks if Abby wanted anything in return for the deed. Denise says she asked for something but she couldn’t give it to her. She says Abby was trying to sell something and didn’t want the buyer to release the details. Denise says she thinks it was something stolen. She says maybe that was worth killing over. Watson goes to find Cortes and says she’s been asking questions about her so she can answer questions. Cortes says it’s not a good time now. She says she’ll find Watson when she needs her then Watson asks if she’s going to talk to more people she knows. Watson comes home and says she talked to Cortes who refused to tell her anything. Sherlock says detectives are cagey and Watson says she thinks it’s personal. Sherlock asks if she slept with one of Cortes’ lover but Watson says the woman is gay so it’s doubtful. Sherlock is trying to figure out what Abby could have stolen from the hospital. Sherlock says maybe she was selling off embryos and Watson says an embryo could have gone for $10k or more. They go talk to Dr Amrit – he went to college with Abby – he does research with embryonic stem cells. He says it’s one of the most promising paths for curing diseases. Sherlock says he knows it’s hard to find material then asks if he bought embryos from Abby. Watson says they can get a warrant and DNA test the samples in his lab. Watson asks how many he agrees to purchase and if he killed her instead of paying. He says it was a trade. He says she wanted access to his lab to run blood tests off the books and after hours. He says Abby wouldn’t tell him what she was testing. Watson wants to check lab records. Amrit takes them to the lab which has been wrecked. He says he initially thought it was a religious nut but now he thinks it’s tied to Abby’s death. Watson and Sherlock report back to Gregson. Watson says the person that destroyed the lab also burned the hard drives. They theorize that Abby thought someone at the hospital fertility lab was engaged in shenanigans. Watson says there may be some clues in the locked bins where research material is disposed. Gregson goes to get a warrant. Watson finds Cortes at a donut shop and says she knows why she’s after her – she was denied a promotion when Vescey wasn’t promoted and Gregson kept her job. She hands her a file and says Vescey was clean and Gregson kept his job because he wasn’t ready to leave. Cortes throws the file on the floor and calls her a citizen with delusions of grandeur. She says cops have enough people looking over their shoulders. Cortes says real cops do the jobs themselves and says Watson doesn’t belong. Watson says she’s not going anywhere. Cortes says she and Sherlock were both leaving and wants to know why they’re back. Cortes threatens her and goes. Sherlock goes through medical waste when Watson shows up. He says all the university lab waste was identified identically so he doesn’t know what was from which lab. Watson suits up into protective gear and tells Sherlock she thinks Cortes is crazy. She worries she’ll know his father pulled some strings. Sherlock says this can’t be settled since Watson is not a cop. He says force Cortes to see her as a peer and then they can resolve this. He reminds her of another story about two cops and how they put their beef aside. Sherlock finds Abby’s handwriting on labels of six vials of blood. They have initials and know when the samples were taken. They were taken between 9 and 10 pm on Thursdays. Sherlock says that gives them a clue. They meet with Ms Russof who ran a cancer support group. Sherlock asks about her taking blood. Russof says Abby told them she had a colleague working on advanced cancer research and could get them into the study if they gave blood samples. Russof says a husband of a group member was skeptical too and called Abby a con artist. He threatened Abby. Russof says it was Kirk Abramovitch. They go see him and he says he didn’t turn anyone into a skeleton. His wife says Kirk just wanted Abby to back off and says Kirk’s mom also has cancer and was suckered by a lot of snake oil salesmen. The wife says she didn’t need the study and her chemo is working. Nate is her oncologist. She says that’s why she gave her blood. There is crying and she goes to get their son. Watson follows her and finds her holding her baby. Watson asks what kind of cancer she is. It’s a spinal sort of cancer on her L4. Watson asks to look at her spine and touches it. She asks how this feels and touches it. She asks if she’s taking anything for the pain and she says naproxen. She asks if the pain is worse at night. Watson says she thinks Nate is right and she’ll make a full recovery. Watson tells them that Abramovitch didn’t do it and says she knows who did kill Abby. Watson says Sadie Abramovitch doesn’t have cancer at all. They bring Nate back into the police station. Watson asks her about Sadie’s cancer case. Sherlock says they noticed some anomalies. Watson says Sadie should have had microfractures that kept her from working. Watson says she has a benign lump there. The lawyer asks what this is and how a possible misdiagnosis is relevant. Sherlock throws files on the table and says there are several dozen – one-third of his patients don’t have cancer. They tell Nate they know his wife caught him at the fraud. Watson says his alibi has also fallen apart. He says everything he did was for the good of the family and says he’ll tell them everything if he can talk to Branford. Watson goes to see Cortes at the gym who tells Watson to stay away. Watson challenges her to a boxing match for charity. Cortes says she’s not a cop and challenges her to fight right then. At home, Watson soaks her sore hands from the fight. Sherlock is making her a remedy – a poultice for her wounds. He says this can avoid a black eye. She says she wants to put this behind her and hopes Cortes can too. Sherlock says she allowed Cortes to land too many punches and Watson says at least she was the one who landed the last one.